American coin silver Aesthetic hammered large rectangular napkin ring having an applied artistâ€²s palette and stylized borders by Wood and Hughes, c.1875. This historically significant napkin ring is inscribed: Alex J. C. Skene 167 Clinton St Brooklyn Weighing 81 grams or 2.6 ozs. Troy, this impressive napkin ring is 2" long, 2 1/16" tall, and 1" wide. It is marked: W&H 373 S Dr Alexander Johnston Chalmers Skene (17 June 1837 â€“ 4 July 1900) was a British (Scottish) gynecologist who described what became known as the Skeneâ€²s glands. He was professor of gynecology in the post-graduate Medical School of New York in 1884, and was president of the American Gynecological Society. CLICK HERE to see a biography of Dr Skene. CLICK HERE to see more on Dr Skene. 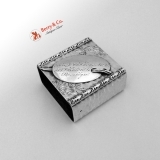 Inscribed as described above, the soft, warm, original finish is present, with no buffing or machine polishing. The excellent original condition and clear detail, with no removals, repairs or alterations, make this an especially attractive offering.